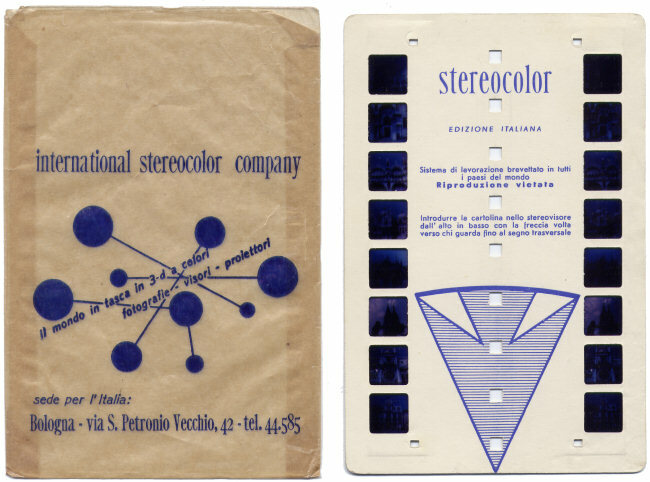 This black plastic Stereocolor viewer was made in Italy by The International Stereocolor Company, Bologna, Italy. It looks a little similar in style to the French Colorelief viewer, especially the slide advance mechanism, although it is a little larger. The two halves of the body are held together with small brass bolts and the slide advance mechanism is all metal. The slogan on the box translates to "The World in your pocket in 3D Colour".